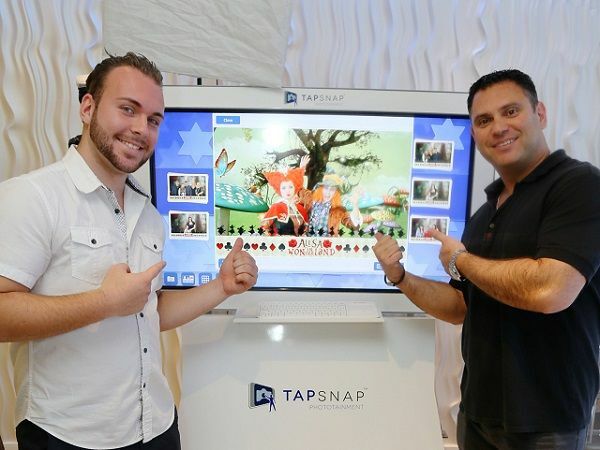 Michael Rozen, owner of TapSnap 1153, shows off his kiosk with a member of his event entertainment team. Michael has been married to his wife Nelly for 15 years and they have 3 children, ages 14, 10, and 5. They moved to NY from Boston in 2002 to restart their lives after 9/11 affected his business. Michael was born in Ukraine and migrated to the US with his family in 1979. He graduated from Curry College in 1995 with a degree in Marketing and Business Administration. He is now the proud franchise owner of TapSnap 1153. What drew you to TapSnap? My wife and I were at an event and there was a photo booth. We took some pictures but were not impressed with the quality or customer service that was provided. After that party, we came across TapSnap and loved the concept of how it looked, worked, and the quality of pictures it provided. I didn’t know until later how powerful the social media part of TapSnap was. We instantly thought that the customer service and quality we can provide would be a huge hit in our company. Why did you pick franchising versus other business opportunities? Most businesses fail if you don’t have expertise in that specific area. Franchising worked for us because it allowed us to learn from the mistakes others made—ones which we didn’t repeat. It’s a great way for someone to get into a business they might be interested in but don’t know where to start or how to start it. I was looking for a business that would provide support and answer questions without me having to play guessing games. What are some tactics you’ve used to grow your business? After coming back from the initial training, I had no clue where to even begin. Everyone I spoke with had one common maxim – “events create events”. I started to speak with anyone and everyone I knew to get the TapSnap name out. I started to offer TapSnap at a discounted price to venue owners for their personal events and also did a couple of free events. I made a huge effort to find out who the top DJs, MCs, event planners, and photographers were in my area and reached out to them. I was introduced to a few amazing groups on Facebook that are specifically dedicated to event planning, where people ask questions about vendors, and I started to push TapSnap there. I asked anyone who used us to write a review. All these things combined prove to work really well as TapSnap is now a household name in my territory for photo entertainment. What lessons have you learned along the way? Is there anything you would do differently? Never sell purely on price. Believe in your product and sell based on value. When I started, I wanted every customer to use TapSnap. I realized we are not for everyone and sometimes you need to walk away. I don’t think I would do anything differently as it’s been a great experience. I was proactive in connecting with other successful franchise owners and picking their brains for what has worked and hasn’t. This has really helped me avoid making costly errors. What is your favorite part about being a TapSnap franchisee? I love being able to work with other franchise owners and share ideas and thoughts. Being able to learn from each other is so invaluable. It saves a lot of time and money from making mistakes. I also appreciate that corporate is trying to stay ahead of the game with technology and being able to offer our clients something new and innovative that they may not be able to find elsewhere. You’ve been a part of some pretty big events. Do any stand out for you? And why? There were a couple of not-for-profit events I did that really stand out, the first was with The Ronald McDonald House. They do a yearly gala at a local venue where all the proceeds go directly to sick children. They have celebrities and local businesses come together to have a silent auction where they sell some amazing stuff. Also, it’s incredible how a community can come together and open up their pockets and hearts for this amazing cause. This brings a lot of smiles to kids who have dealt with so much pain and adversity. It’s a really remarkable event! What advice would you give someone considering this business? What type of person do you think makes a great franchisee? This is an awesome business for someone who understands how to sell based on value rather than price. There is a lot of competition and people need to differentiate themselves. The best advice I can give someone is to be relentless. Build a lot of relationships with venues, DJs, photographers, MCs, etc. Add value to them by not just selling yourself but rather help bring them business. Join a lot of groups on Facebook to get your name out. Do as many events as possible so people get to touch and feel TapSnap and see the difference between TapSnap and other providers. My biggest advice is to not get frustrated and really follow a process. Like any business, it takes time to build a reputation and a following. Provide the best customer experience and go above and beyond what they would expect. Don’t be afraid of asking the client to write a nice review of the great work you do. What’s next for your franchise? Where do you see yourself in the next 5 years? My plan is to get another kiosk in 2016 and to continue to grow. I have had success with social events and would love to grow more corporate accounts. It’s tough to predict where we will be in 5 years but I hope we can continue to build upon our great reputation and expand our marketplace, including getting into other locations. Lastly, why do you think people love TapSnap? Why is it so successful? TapSnap is fun and interactive. It allows people of all ages to have a great time. It’s amazing to see the looks on people’s faces when they walk into a room and see the 42” touchscreen. What’s even better is their reaction when they see themselves on the monitor and are able to touch it and change the background or add props and scribble messages. It’s really a unique photo experience that most people haven’t see or experienced, which guests fall in love with instantly. Also, the quality of the pictures is professional grade which people typically haven’t seen with the traditional booths. 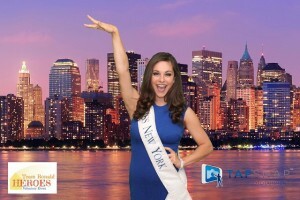 If you’re on the lookout for an excellent photo entertainment experience in Brooklyn, New York, be sure to get in touch with TapSnap 1153. Thinking about becoming a franchise owner? Consider TapSnap! To learn more, fill out our form to receive our Franchise Information summary! Or simply give us a call at 1-877-577-0566 if you’d like to chat.